Just a heads up to aussies here. I just bought a supposedly high quality electronic distributor from N & P Performance Parts on ebay. After quite lengthy discussion convincing me that their product was high quality, not some cheapo Chinese knock off, I bought one. I didnt want to buy the super cheap $80 ebay ones and I didnt want to spend $800 on an MSD so I bought this "excellent quality MSD replacement" as they put it for $390 from a reputable aussie seller thinking it would be a good idea. The car ran like crap, really bad and pinging its head off. The supplier said the I was the exception and the distributor is good for everyone else. No more help from them and they dont respond to any more messages. Just ignore me now even after sending them the data asking them for help. I took it to the expert they recommended early on to get it more suitable curved to the same spec as the original as all that pinging and poor performance couldnt be doing any good. The expert they sent me to said "oh, another one of those pieces of Chinese s%^t"
This is the result, a curve that is totally useless for pretty much anything Ive ever seen on 4 wheels. Not just useless but dangerous for our motors. Cost me another $150 to have it recurved back to suitable standard spec and to make it worse, the module was rubbish and had to be replaced with a Bosch for another $100. So all up, another $275 (with GST) to fix something that was supposed to be correct and plug and play. Should have bought an MSD for a few bucks more. 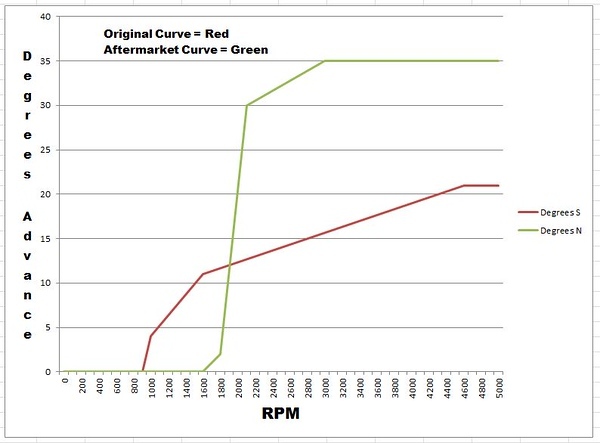 Have a look at this dangerous ignition curve compared to stock! Hoping none of you get caught out like I did! Location: Melbourne, Australia Sorry to hear your tales of woe , its aweful buying something someone lied to you about . This is the very reason I only use Genuine correct numbered parts on my cars , I would be livid if this happened to me . I guess a hard lesson learned and one we've all been through annoyingly , but at least you got it sorted in the end even if its not the nicer part you wanted . Yeah, I should have got the $80 one and saved myself $300! What carb are you running? Location: Melbourne, Australia I Always run the correct numbered AFB 4 barrel Carb the car came with , ive never had a problem . Once you change one thing on engines it changes many other things , so stock is best in my opinion , but most people don't agree or think like that, so don't let me sway you ! I just bought a complete NOS 392 hemi Distributor on ebay for $250US , it cost $375 AU here to rebuild an original and it wont ever be like NOS . I Always run the correct numbered AFB 4 barrel Carb the car came with , ive never had a problem . Once you change one thing on engines it changes many other things , so stock is best in my opinion , but most people don't agree or think like that, so don't let me sway you ! I just bought a complete NOS 392 hemi Distributor on ebay for $250US , it cost $375 AU here to rebuild an original and it wont ever be like NOS . I like stock as well. Car Manufacturers spent bucket loads of money getting it all to work correctly together.. Never had a problem with points on my cars or bikes. Have had a crap load of problems with electronic ignition, factory and aftermarket. Location: Sydney Im using the stock Carter, just rebuilt it and just jetting it correctly to suit the manifold. Location: Echuca Try Performance Ignition systems in Melbourne next time, they do amazing work and are very quick. I've had numerous done by them over the years, many will know their scorcher brand. Send them the engine specs and they will do the rest. Try Performance Ignition systems in Melbourne next time, they do amazing work and are very quick. I've had numerous done by them over the years, many will know their scorcher brand. Send them the engine specs and they will do the rest. I would have gone down that road if Id known earlier but after modifying the engine bay, then spending another couple hundred bucks to get it sorted, I figured Id cut my loses and move on. The first thing ebay/paypal would want is for me to return the item.